Gracious mansions and thundering waterfalls. Battleships and nostalgic fireboats. Power plants and Indian long houses. Just as Western New Yorkers begin planning summer safaris with families and out-of-town visitors, a new book showcases the region's unique smorgasbord of historic, natural and architectural attractions. 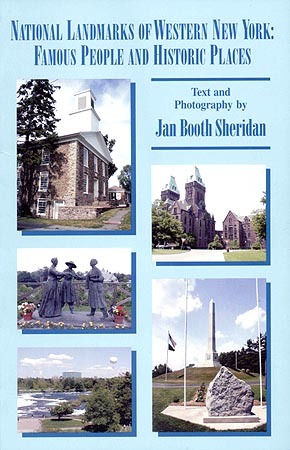 East Aurora author Jan Booth Sheridan has researched nearly 30 National Historic Landmarks in the Buffalo-Niagara and Finger Lakes regions. Dozens of photographs, addresses, locator maps and a comprehensive index make this a handy armchair companion as residents explore their home turf. The result is a user-friendly book called National Landmarks of Western New York: Famous People and Historic Places. But this isn't just a book about buildings. Fascinating characters spring to life in an engaging text, shedding new light on the region's heritage. From the British general who captured Old Fort Niagara from the French, to Harriet Tubman's heroic involvement in the Underground Railroad, National Landmarks is as much a book about people as it is about architecture. As readers explore the sites, they'll encounter people like Millard Fillmore, Susan B. Anthony, Theodore Roosevelt and Frank Lloyd Wright. The oldest operational fireboat in the nation, possibly the world, is docked in downtown Buffalo? The largest inland naval park of its kind in the country is located on the Niagara Frontier? The oldest cobblestone church in North America is right here in Western New York? One of the earliest steel-frame skyscrapers graces the Buffalo skyline?